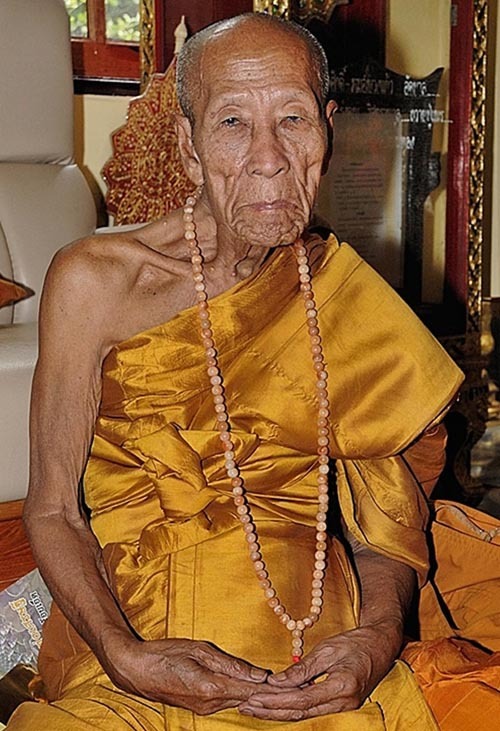 luang Phu Kambu – 89 years old, of Wat Gut Chompoo, Ubon Rachatani, is a Master Gaeji Ajarn who is believed to have very powerful Puttakom (Buddha Magic power). Luang Phu is a direct Looksit of the lineage of Pra Kroo Wirote Ratanomol (Luang Phu Rod Nantaro), of Wat Sri Mueang, and is the ex Boshop of Ubon Rachatani province. He was born in the village of Gut Chompoo on the 15th of February 2465 which was a full moon monday in the year of the dog. He had the surname ‘Kam Ngaam’ (meaning beautiful gold). His mother and father were Mr Sa and Mrs Hom Kam Ngaam. His family were farmers. He was the youngest of 6 siblings. He is currently one of Thailands most famous Guru Monks, whose amulets are of the most sought after in the modern amulet movement.